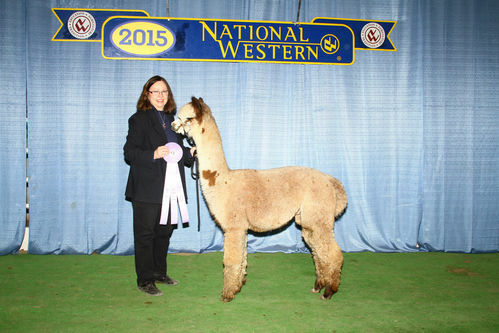 Per Snowmass Alpacas, "Enlightenment is the most magnificent grey stud we have ever produced". Per the 2009 Kentucky Classic Judge, without a doubt, best male animal in the show. This stunning male combines perfect confirmation and magnificent fleece. He is the "Total Package". We are SO proud of this boy. Still taking Color Championships! His 2018 Fleece just took CC at the 2019 National Western Stock Show! 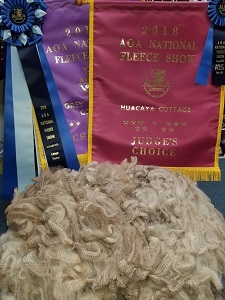 His 2017 fleece took the Gray Color Championship in Cottage Fleece AND Judge's Choice in Cottage Fleece at the 2018 National Fleece show. 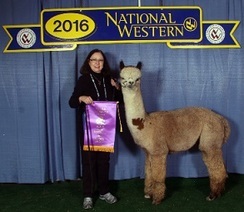 This is his 3rd Color Championship in a row in Cottage Fleece at the AOA National Fleece Show! His 2018 fleece took a 2nd out of nine in the Mature Class. This was his 6 year old shearing and he was up against 3 year olds! 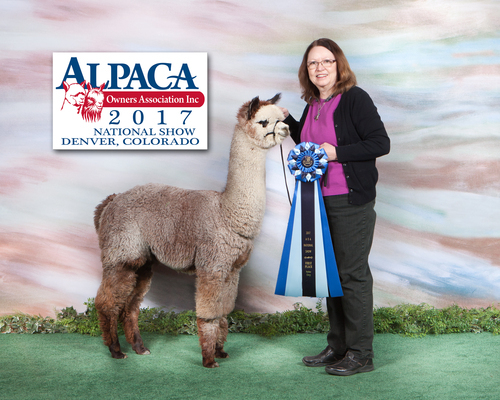 His 2017 fleece took the Gray Male Championship at the 2017 AOA National Fleece Show and his 2016 fleece just took the Gray Color Championship in Cottage Fleece at the 2017 AOA National Fleece Show! Let this 18X Champion, 19 Blue Ribbon boy enhance your herd! His 4th shear fleece received 18 points for fineness and hand at ABR Fall Fest. We only go to 2 - 3 shows per year--so imagine where he'd be if we could get to more shows annually! His first cria, BSRA Minnie Pearl,a girl who looks just like him (as you can see here) just took her first blue ribbon at AOA Nationals! We are over the moon! There are a number of Patron cria due this summer and we cannot wait to see them! 3 of them have now been born and they are carbon copies of him! 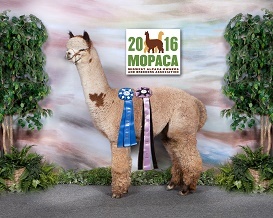 He just took Color Champion in Fleece at the 2017 MoPaca Show. Judge Wade Gease's comments were priceless! He wrote, "OMG! Impressive to see this quality being held in this age category"
At MoPaca2016, Judge Sharon Loner awarded Patron the Reserve Color Championship at 43.4 months, noting his great conformation and presence and the continuing fineness and character of his fleece. Patron earned the Gray Male Color Championship at the 2016 National Western Livestock Show in Denver. 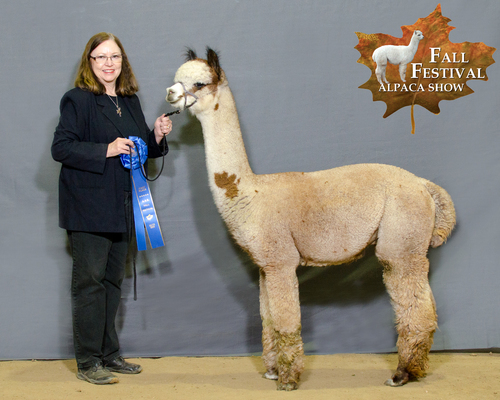 At the 2015 ABR Fall Fest, he was awarded the Gray Color Championship in Fleece and a first at Halter. This boy just keeps getting better! Judge Diana Timmerman said there was just the slightest smidge of difference between the now 6 time color champion and Patron when she awarded him the Reserve Color Championship at the 2015 National Western Stock Show in Denver! And she is a gray breeder herself! She loved his typey head and overall look and conformation. We were tickled gray! Patron is now breeding. Let him add his fineness and density to your herd! Patron is a beautiful rose gray boy with lots of crimp and a wonderful hand. "He's so soft!" was the comment by Judge Wade Gease at GWAS in 2013. Combine this with a typey head, great confirmation, and the sweetest personality and he's the total package!